The transfer station is electronically set up to provide our town residents with accessibility day or night. 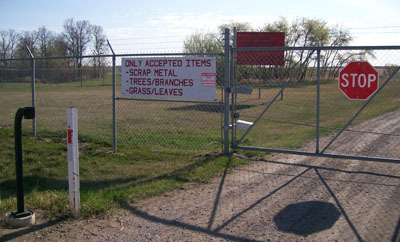 The Town of Balgonie offers these services on site at the transfer station, but has the added responsibility to ensure that environmental regulations are followed. Municipalities can be fined for burning unapproved items and not disposing of things in the manner set forth by the Provincial Ministry of Environment and the Provincial Clean Air Act. Recently, items have been left at the transfer which are not permitted. Please ensure that you read and understand what items are allowed and not allowed to be left at the transfer station. Individuals who leave items which are not allowed will be required to clean up the improper disposal, and/or pay charges for the Town to remove the items. The transfer station cards can be cancelled at the discretion of the Council of the Town of Balgonie. The transfer station is not a garbage dump! The first Friday of every month, a Loraas bin is delivered to the transfer station. This is for town residents to use for the items which are too large for the household carts. Please note, this is only to be used by Balgonie residents. Larger loads due to fence removal, renovation etc, should be taken to the Regina landfill. If the bins is full or not at the site, do not leave items, take them to the landfill. Key cards, which are lost, should be reported to the Town Office. They will be removed from the computer system and a new card will be issued at a cost to you of $25.00. If you are moving, please return the key card to the Town Office. Diabetes also have clothing bins to take donations. Website by DW Technology Inc.